I don't know if I've ever shared this with you, or not. But I'm one the biggest fans of mushrooms. Ever! I'm serious. It hasn't always been that way. My Mom is a HUGE mushroom fan. Always has been. But me. It took me a while to get "on board." But once I did, there was no turning back. Not at all! 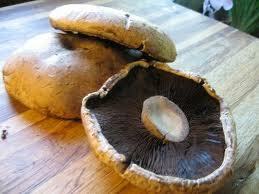 I must buy 2 boxes of mushrooms, from COSTCO a week! I eat them raw. I add them to my favorite recipes. Heck, I just enjoy them every single day. So when I got this yummy cookbook recently, there was no looking back! I was thumbing through, and noticed a certain little recipe. I wanted to make it immediately! But with all this traveling, it was pushed back. Until this week. And I was at home. Looking at one of my favorite websites. Hello! Gooseberry Patch posted this recipe. It's this week's Recipe of the Week! A match made in Heaven!!! Cook pasta according to package directions; drain. Meanwhile, heat oil in a large skillet over medium heat. Sauté mushrooms until tender, about 5 minutes; drain any extra liquid from pan. Add milk and garlic salt to skillet; heat just to boiling. Stir in both packages of cream cheese and basil. Reduce heat to low; cook, stirring constantly, until cream cheese is melted. Stir in Parmesan cheese; cook over low heat until melted, about 3 minutes. Serve over pasta. Makes 8 to 10 servings. This was dinner Wednesday. Mostly because we've been so busy. And haven't been to the grocery store. I had everything on hand. And whipped this up in no time! I made a few changes. I added onions. In this house, we LOVE them! And I used a few cloves of garlic. You know, instead of garlic salt. The flavors just melted together. And made such a yummy meal! Just a Girl in the World. Words don't change a thing. "FOR I KNOW THE PLANS I HAVE FOR YOU......."
My Wren Photo Won First Place in the First Annual Bird Day Free Bird Photo Contest! This is me. No reservations. Happy New Year Pretty Fabric too, of course!